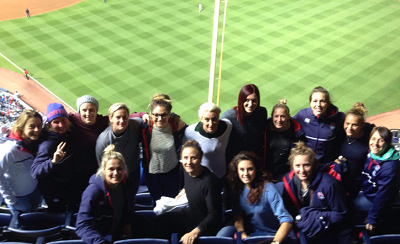 In her first blog for us, England star Amy Wilson-Hardy tells us about her side's excellent two weeks taking in the USA and Canada, where they picked up their first title of the season. There is a definite sense of excitement, despite the bleary eyes as we meet at Surrey Sports Park – our training base – at 6am on Sunday morning. We are about to leave for the only double header in the Women’s World Sevens Series this year; Atlanta, USA followed by Vancouver Island, Canada. Travelling with a large group very rarely runs smoothly and this trip is no different. ‘Are you on a school trip?’ is a common question we are asked whilst boarding the plane in our matching ‘uniforms’. The response is normally an awkward giggle and eventually someone is brave enough to say we are the England Women’s sevens team. We are instructed to stay awake on the flight so we become accustomed to the time difference in Atlanta, a perfect excuse for me to stick my nose in a book. I love reading but during a training week at home, I normally reach three sentences before falling asleep. On arrival at our hotel, the squad’s first thoughts are usually bed or food. In this case, since it is dinner time, we head straight for the food hall. Going into our first meal is always a significant part of our trips. All the teams eat together so it’s the first opportunity to see the different countries and who each team has brought with them in their squad. We pile our plates high with nutritious food, shovel it down as quickly as possible and head straight to bed, exhausted. By the time we arrive in Atlanta, the intense training that happens at home has been tapered off to make sure we go into competition feeling fresh. There will be a selection of gym and on-field sessions. We head to a fantastic gym during the week, which to our delight, has a basketball court, and it doesn’t take long for us to all be playing “killer”, a game which relies on accurate shooting under pressure to win the game. Team morale is hugely important when competing. We know when we need to switch on and focus but there will be times when we can have a bit of fun. This also includes downtime. Although recovery is crucial, we need opportunities to get out of the hotel. This year, along with the compulsory mall visit, we head to a baseball game. It’s only a matter of time before we are in with all the jeering and chanting, trying to draw attention to ourselves so we can be involved in the hug cam when the teams are changing over. We follow the lead of a group of guys behind us, only to realise about half an hour later that they probably know even less about the game than we do! As we enter day one of competition in Atlanta, we know we have a huge challenge ahead. First up is Australia, the Series leaders. They are known for the phenomenal skill set and pace across the board and so far this year, have not been beaten. Fiji is our second game, who are arguably the most exciting team to watch in the competition and on their day can be absolutely devastating. Our final game is Colombia, who have not competed on the World Series before, so are a different kind of test for us as little is known about them. We take three from three on day one and go home feeling confident and proud of our performances. There is a buzz as we eat our dinner and head to bed to recover for what is going to be an even more challenging day two. Although performing well on the first day is important, the second day is finals day – where the medals are won. Day two sees us beat Russia in game one, setting us up for a semi-final against New Zealand. We are gutted as we come off the pitch having lost the semi, knowing that we didn’t front up physically or match the standard of performance we were hitting on day one. However, sevens is about playing to the end and there is still a third/fourth playoff against Canada. Our captain Emily Scarratt, aka Scaz, leads us inspirationally throughout the last game showing what a class athlete she is; phenomenal skill set, work rate and determination and we win, leaving us with a third place finish. It goes without saying that we would have preferred first but England have shown what we are capable of. We have another tournament next week where we can build and show the consistency in performance that we are yet to show this year. The following morning, after a quick recovery session, we are straight on the plane to Canada with a few bumps, bruises and ‘prop necks’ which any prop in the fifteen a side game would laugh at and dismiss instantly! After a good night’s sleep, we head out for a walk through the beautiful town of Victoria, situated at the south of Vancouver Island. The girls who went the year before know exactly where we are heading. To the seals! 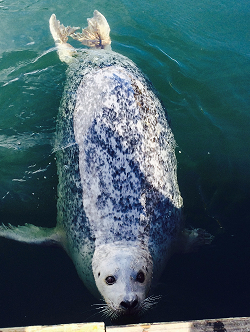 Fisherman’s Wharf is a five minute stroll from the hotel, where you can buy fish and feed a group of seals who appear to get fed quite often by passing tourists. However, you need to be aware of the greedy seagulls who also instantly detect the dangling fish. Last year, one swooped and hit me on the head, this year, they nearly take off Heather Fisher’s hand. It is not long before game day has sneaked up on us again. This week we have Ireland, Japan and Canada in our pool. There was a time when you knew you had at least one easy game in your pool, but that can’t be said anymore. Every team has improved and you can guarantee that if you are off your game, any team can capitalise. We play Ireland a lot in training games and know what a physical challenge they will be. They also have great rugby brains. Japan are constantly improving and have a great work ethic. Canada are one of the top sides in the world and playing them on their home turf will make it even tougher. We scrape two wins in our first two games against Ireland and Japan, and although our performance improves a little for the last game against Canada, we go down 5-0. Going home, there is a completely different feel to last week. We have not performed well. But we do have a quarter final tomorrow. It’s against USA. The last time we faced USA in a quarter final was in Brazil, where we lost. But as I mentioned before, sevens is all about day two. Three good performances tomorrow could lead to us bringing home a trophy. Day two game one. Victory. Day two, game two, versus Australia. Victory. We are in a final. My first World Series final since being part of the sevens programme, and England’s first since 2013. We face New Zealand. Time to correct the score from last week. It does not matter how tired we are feeling now. Two weeks of playing, every team will be tired. It is time to trust our preparation, follow our processes and finish a job that we essentially stared in Atlanta. Show that we are a team to be reckoned with, and keep improving on our road to Rio for the 2016 Olympic Games. Scaz leads us out to sing our national anthem, a privilege that only occurs when reaching a final in sevens. It is an emotional experience but everyone remains focused. There is a calm energy that is hard to explain. Twenty minutes of rugby begins. If I am honest, I can’t really remember much of playing. “If I do my job, and everyone else does theirs to the best of their ability, we will win this game,” I recited in my head. I reluctantly came off the pitch with two minutes left of the final. I had done all that I could and now it was a waiting game. Danielle Waterman, , aka Nolli, and I are standing next to each other when, so appropriately considering her efforts over the last two weeks, Scaz wins us a penalty. The score is 31-14 to us, with five seconds to play. 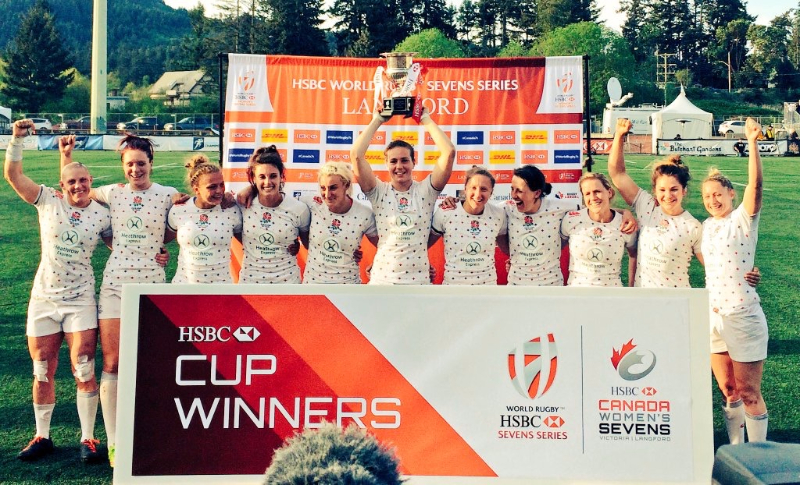 We hug each other as we realise we have won the game and more importantly won Canada Sevens! There is a sense of euphoria surrounding winning a tournament that is hard to explain. Your body is relying on adrenaline as it is physically absolutely exhausted. You are looking around and seeing such genuine emotions and it is then you realise you are part of something really special. You’re tunnel-visioned as you run onto the pitch to celebrate with your team, with both players and staff as we really are in it together. Everyone has put in so much to get to this point. “You only get what you deserve,” is a common saying from Simon Middleton, our head coach. Looking ahead, on our road to Rio, we have one World Series tournament left in France, one European tournament and a lot of hard work and preparation. 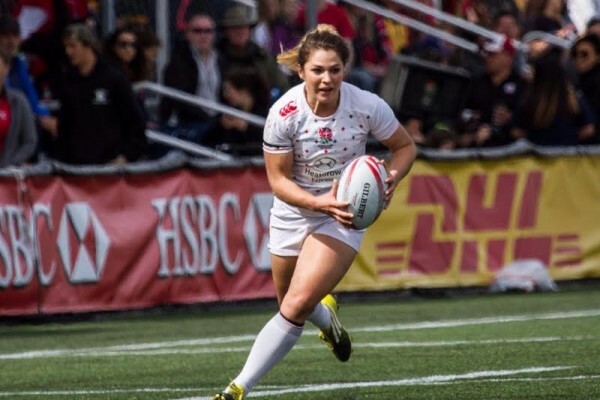 Winning Canada Sevens is a step in the right direction, but there are a lot of excellent teams competing and England are by no means getting ahead of themselves. There are an exciting few months ahead! A special mention must go to Vicky Fleetwood who lost her mum Pam whilst we were away in Canada. Vicky showed such strength and courage when training at home whilst her mum was ill and really was an inspiration to us all. Our thoughts are with her and the family at this hard time. A special thank you must also go to the New Zealand Women’s sevens team, who showed what it means to be part of the sevens family. Their tribute in honour of Pam Fleetwood moved us all to tears. Amy Wilson Hardy represented Great Britain at the 2016 Olympic Games in Rio. She is one of the 18 players preparing for the 2017 XV Women's Rugby World Cup to have been awarded a fulltime professional contract by the RFU earlier this year.